I’ve written before about the legend of Video Ezy, and much has been written since about its downfall. Gather ’round, kids, and I’ll tell you a tale. It should come as no surprise to anyone that the days of the video shop are long over, with so many titans of the industry falling in recent times. As recently as 1996, today’s home entertainment climate seemed unthinkable – an era in which an unlimited well of entertainment options is available in one’s own home. Sure, occasionally you’ll spy a lone DVD kiosk, now the pillar of the industry (an industry…), standing unloved in a shopping centre somewhere, but I’m willing to bet very few of you have ever used one. 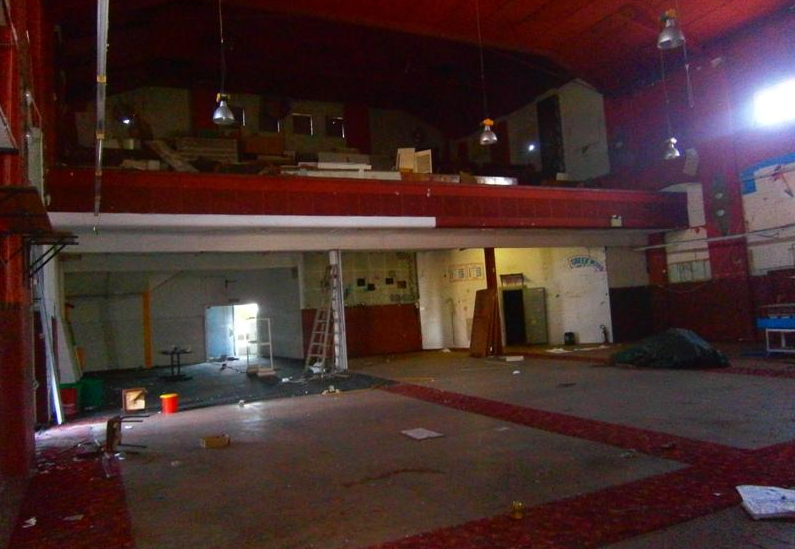 So neglected by society is the concept of renting entertainment that few, if any, memorial sites exist today for what was once such an everyday part of life. That libraries survived the format war – and continue to thrive today – speaks volumes about how far from grace the video shop has fallen. 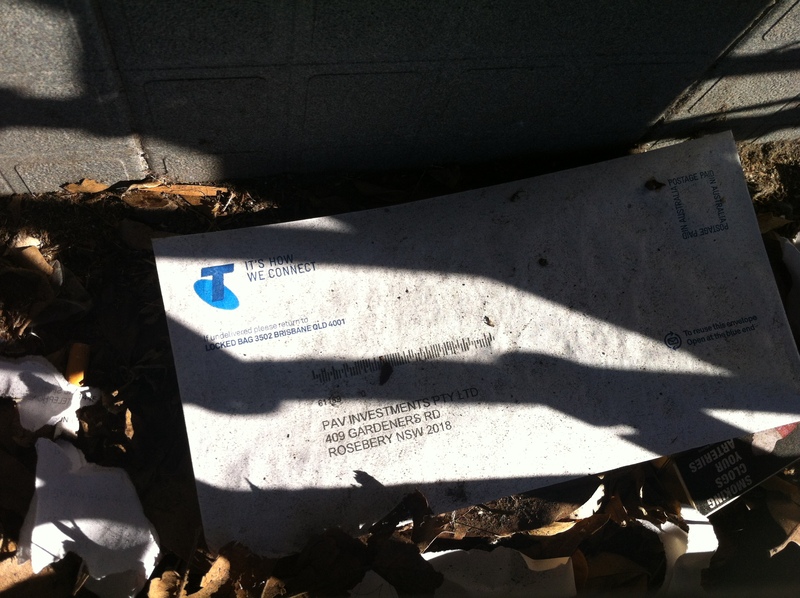 But here, in this dark, menacing alleyway in Narwee, the legacy lives on. Look up and you’ll see a typical example of the de-ezyfication process. 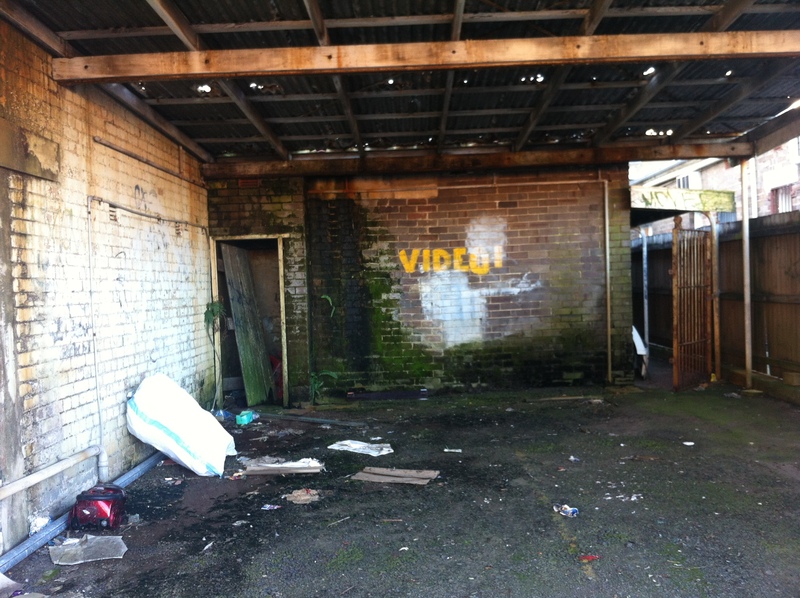 Even before the graffiti artists got to it, a more professional job had been done on the “Ezy” part, presumably as some off-brand video shop took up Video Ezy’s old space in those dark later years. Around the front, you’d never know any of that. Four separate, entirely uninteresting businesses now occupy the huge floorspace you know Video Ezy would have filled effortlessly. If there’s one thing vendors of unwieldy tape-to-tape spools contained in cumbersome plastic cases did well, it’s take up real estate. On the west side, our quarry is left relatively untouched, and we can see that the building once housed a supermarket as well. Just for a moment, take yourself back to one of those Friday nights, when someone couldn’t be bothered cooking and there was nothing on TV. You’d head down to the video shop, where part of the fun were the hours it took just to decide on one title (and with the prices as they were, who could blame you?). You’d grab some popcorn because you’ve been conditioned as a corny traditionalist. You’d hit up the supermarket for a bucket of exotic ice cream (which for some meant a Viennetta). And then you’d head home via the nearest fast food joint and ring in the weekend with the biggest Hollywood stars of the day. That’s right, you didn’t ask for much out of life. ..one of community, harmony, and happy weekends full of leftover Viennetta, when you got it the first time or got it free. The Marina, 1941. Image courtesy City of Botany Bay Local History Image Archive. 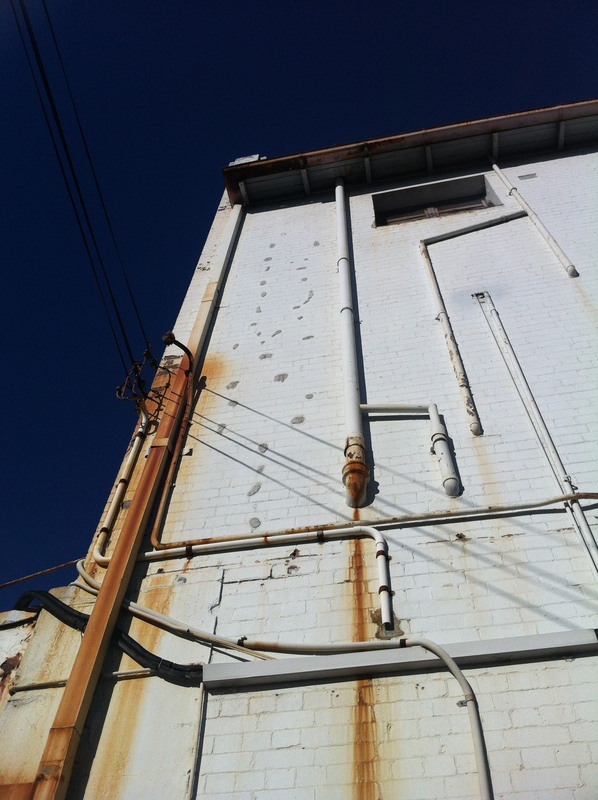 Sometimes revisiting a place can reveal secrets you missed the first time. 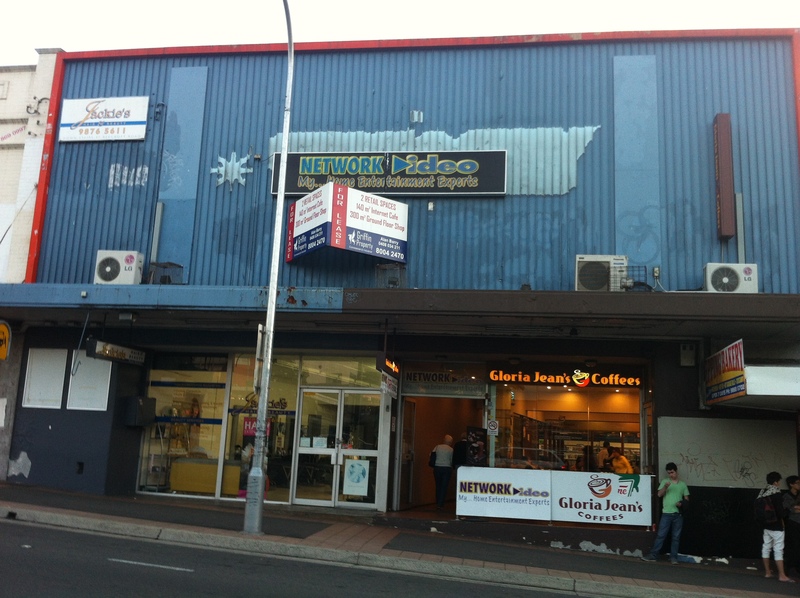 Case in point, the rotting behemoth on the side of Gardeners Road formerly known as Videomania. 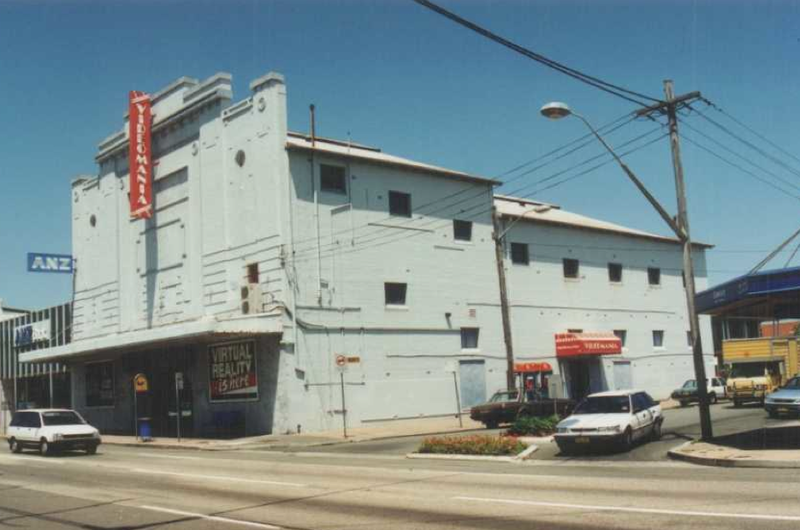 In its glory days this was the grand Marina picture palace, which operated until 1984 – a time when video killed the theatre star. I tried to get the same angle as above, I really did. Another place for which time seems to stand still, Videomania remains relatively unchanged since last year. Sure, there are some new posters up along its face and there’s a new cupcake shop in the old bank next door, but the building itself is no different. We can only speculate as to how long those promo guys were waiting, longing to plaster the front of the place with their posters. I suppose the temptation became too much at some point, much to Jack Dee’s benefit. 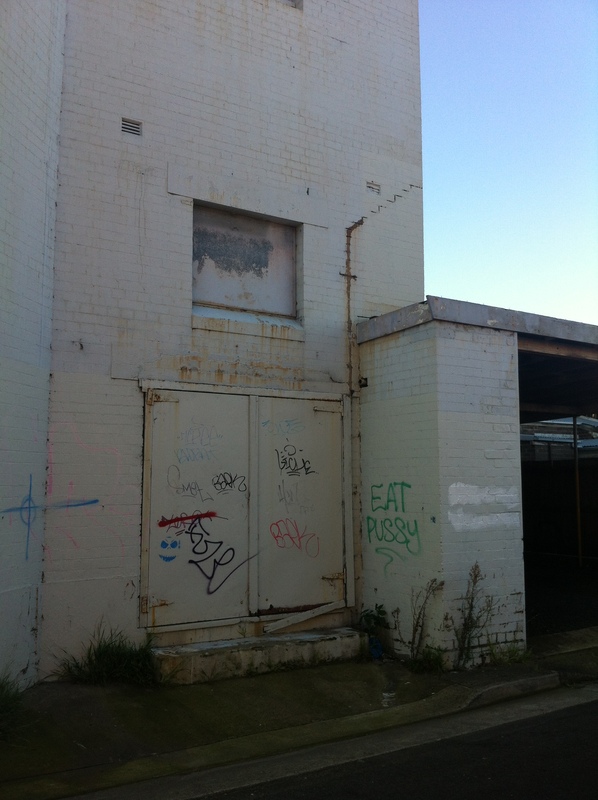 Out the back, I encounter some inspiring graffiti and little else. 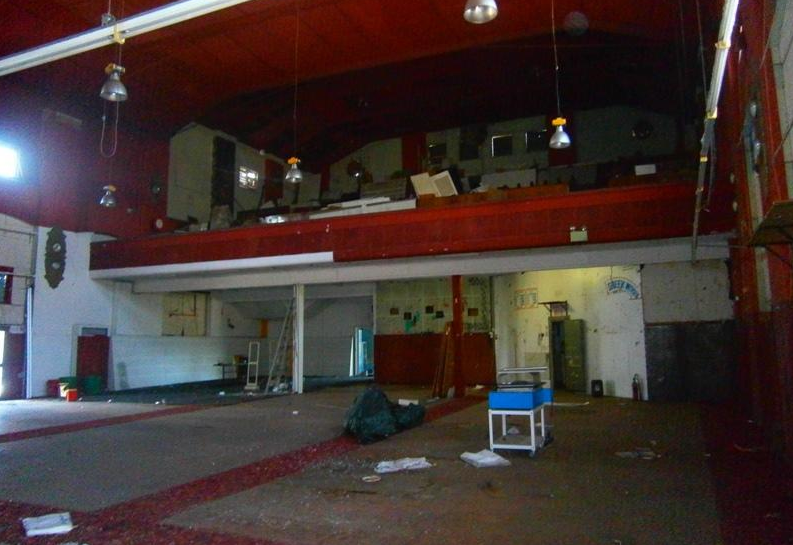 The place may still be for lease, but they certainly haven’t expended any effort making it presentable. I’m guessing that vacuum doesn’t work. How about now? The ‘R’ or maybe the ‘N’ should hit you first, and then from there it’s easy. 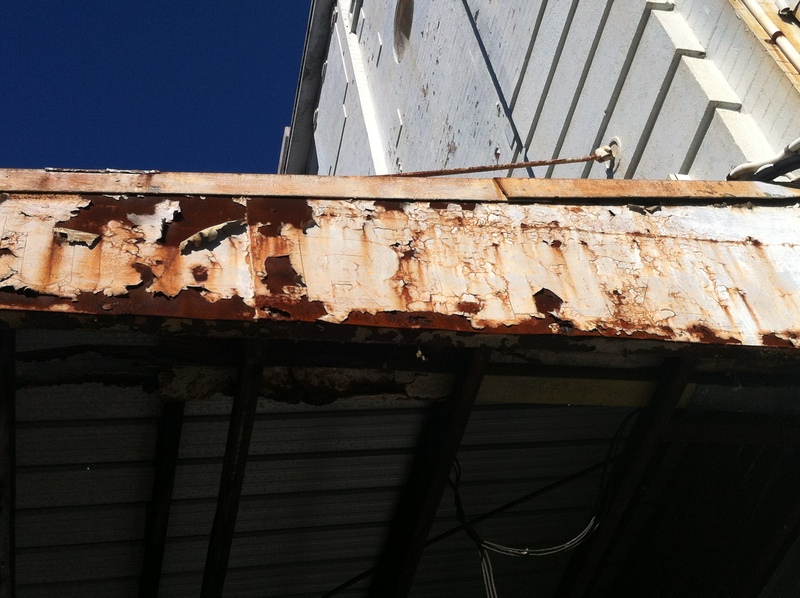 Yes, amazingly, the awning’s decorative ‘MARINA’ lettering has somehow survived, allowing us an even deeper glimpse into the past than it was thought possible. Now all we need to do is arrange a screening of ‘Puddin’ Head’ inside. Maybe we should get in touch with the owners? We’re in the home stretch now, only three to go. Here’s a clue for the next entry: it’s another theatre. 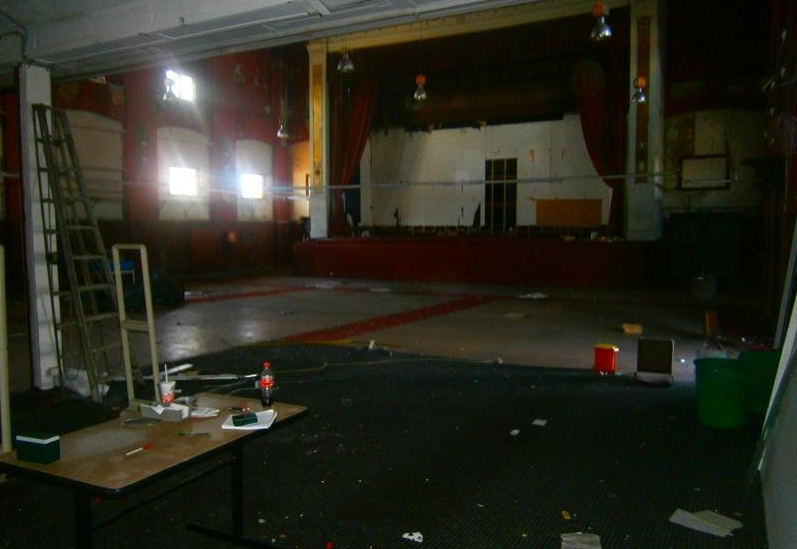 ROCKIN’ UPDATE: The development-minded Vlattas family, owners of the Cleveland Street Theatre and the Newtown Hub, are currently renovating the Marina with the aim of turning it into a live music venue. My suggestion: keep Leonardo as your bouncer. Thanks, reader Rozie! 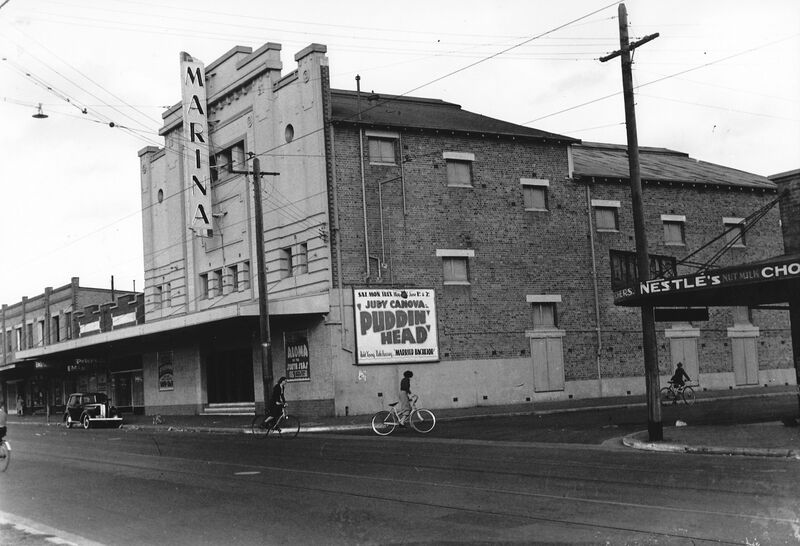 The Marina Theatre, 1941. Note the two sweet shops sitting to the left of the cinema. Also notice the bicyclists not wearing helmets, a quick way to end up with a puddin’ head. Image courtesy City of Botany Bay Local History Image Archive. The Marina Picture Palace opened in June, 1927 with a hot double feature of Sparrows, starring Mary Pickford, and The Beloved Rogue, with John Barrymore. Here’s an off-topic aside: The Beloved Rogue became a lost film for 40 years after its release until a well-preserved copy was found in the private collection of Mary Pickford. Now we can all enjoy Barrymore’s admitted overacting as Francois Villon. 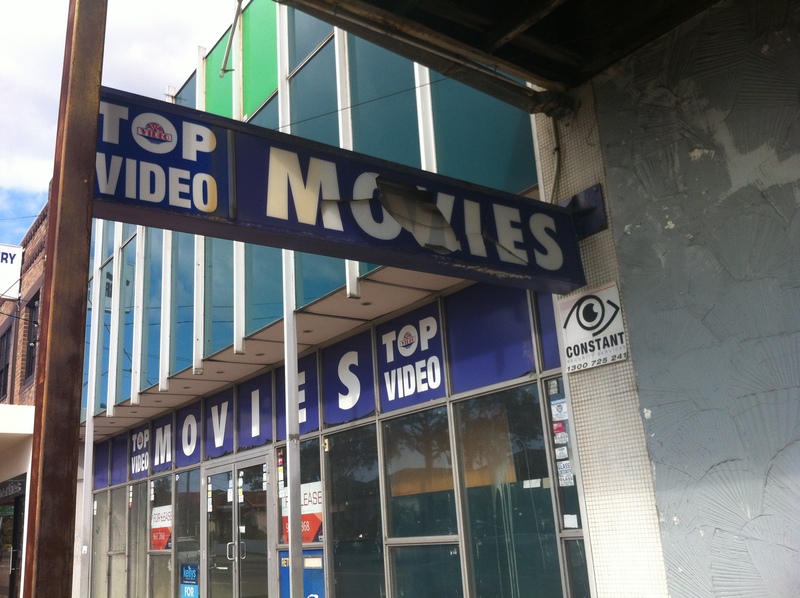 At least, we could if our video shops were as open as they used to be. 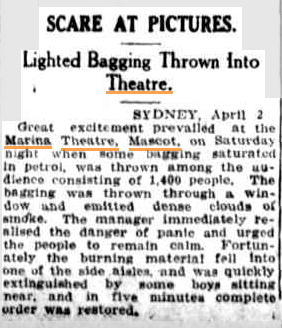 Townsville Daily Bulletin, 3 Apr 1928. The reference to ‘complete order’ is very Third Reich, isn’t it? Also, it really was ‘fortunate’, wasn’t it, that the molotov fell into the ‘side aisles’ (cheap seats). Yes, what a bit of excitement. 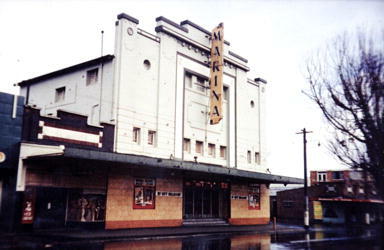 The Marina Theatre, 1952. 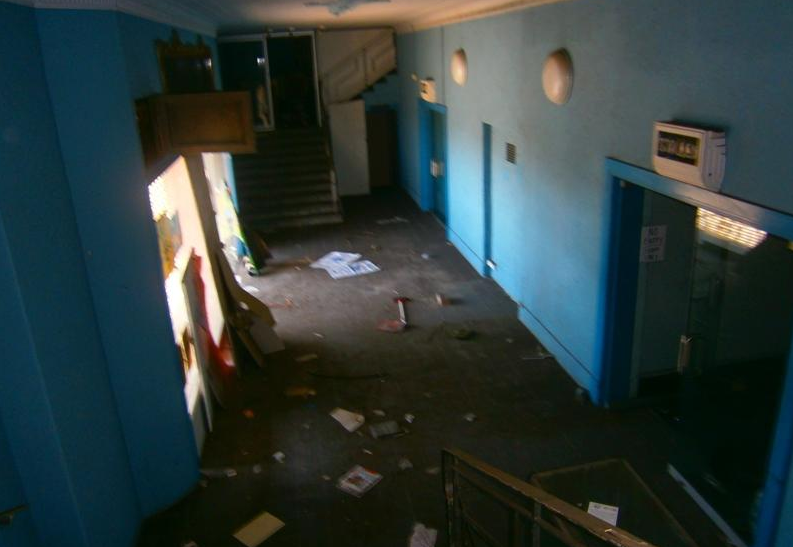 Note that only one sweet shop remains. Image courtesy Sydney Reference Collection. 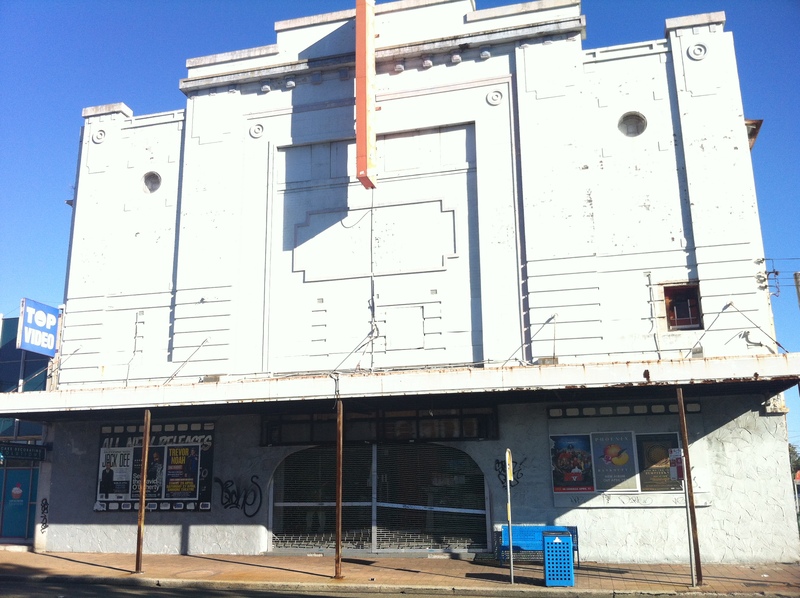 From the early 1960s, the cinema opened and closed a number of times under various independent ownerships. It’s safe to say that if even Hoyts wasn’t taking the bait and buying it up, it must have had something wrong with it. 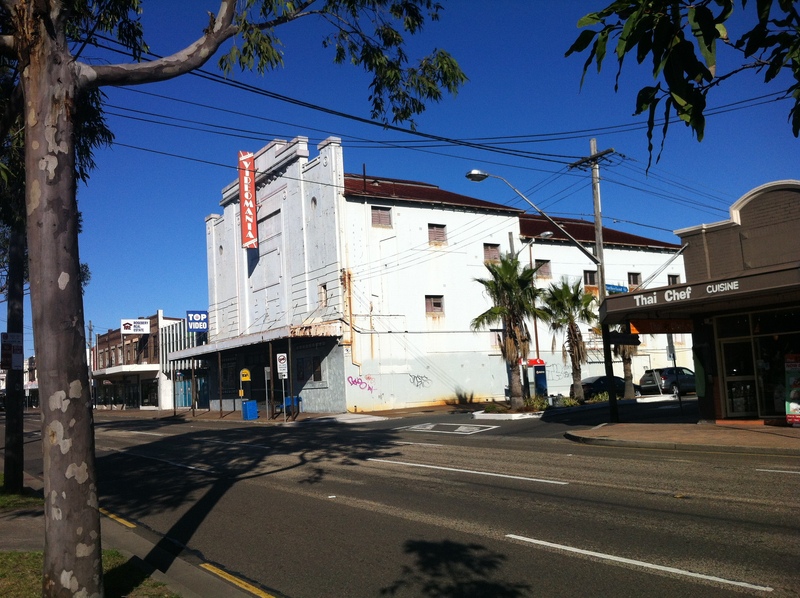 The Marina’s stop-start existence carried on throughout the next twenty years until it was renamed the Rosebery Cinema in the early 80s. That’ll get the crowds back in. Or maybe it was to fool the molotov throwers into thinking it was a different cinema? Either way, GOOD PLAN. So good in fact that the Marina closed for good as a theatre in 1984. Here’s where we come in. Since that time it’s been Videomania, and now a derelict hulk. It’s a close call, but one of these incarnations is slightly more interesting. 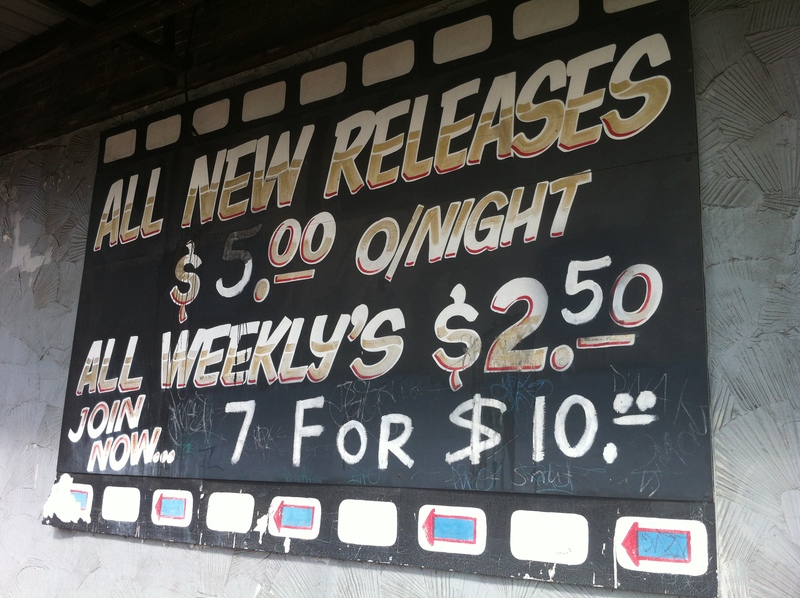 Fittingly, Videomania closed in 2002, when video-mania had all but died out, and videomaniacs had flocked to DVD. Rather than switching to a better quality format that takes up less shelf space, Videomania chose to fall on its sword. 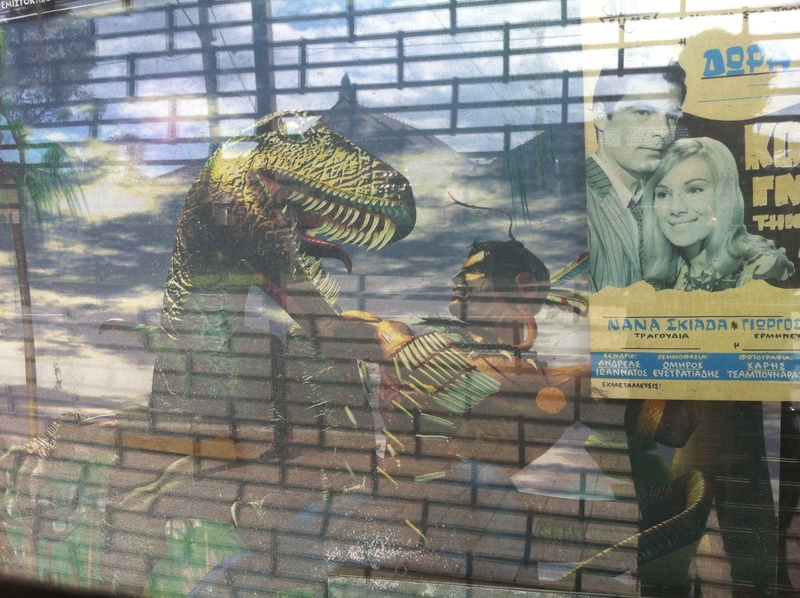 Even though the site is empty, the front window still contains some strange sights. 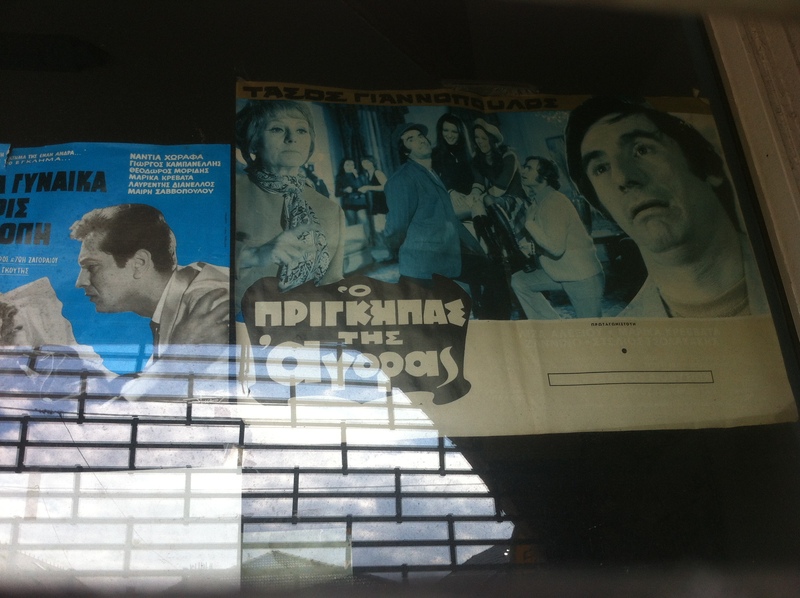 A series of Greek film posters sit in the window too. Doesn’t that one on the right look enticing. Can’t wait to see that one. There’s a poster for the Nintendo 64 game Turok: Dinosaur Hunter, which was released in 1997. The Nintendo 64 was discontinued in 2001, and Acclaim, the company responsible for Turok, went out of business in 2004. Fitting choice. 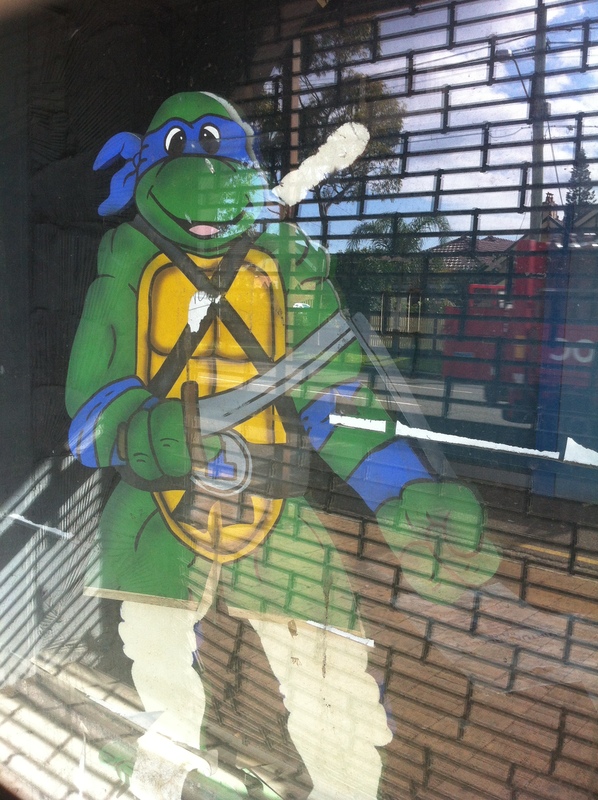 My favourite, and most bizarrely of all, is this full sized Leonardo standup. This isn’t the first time I’ve encountered the Teenage Mutant Ninja Turtles during my adventures with this blog, and I’m sure it won’t be the last. 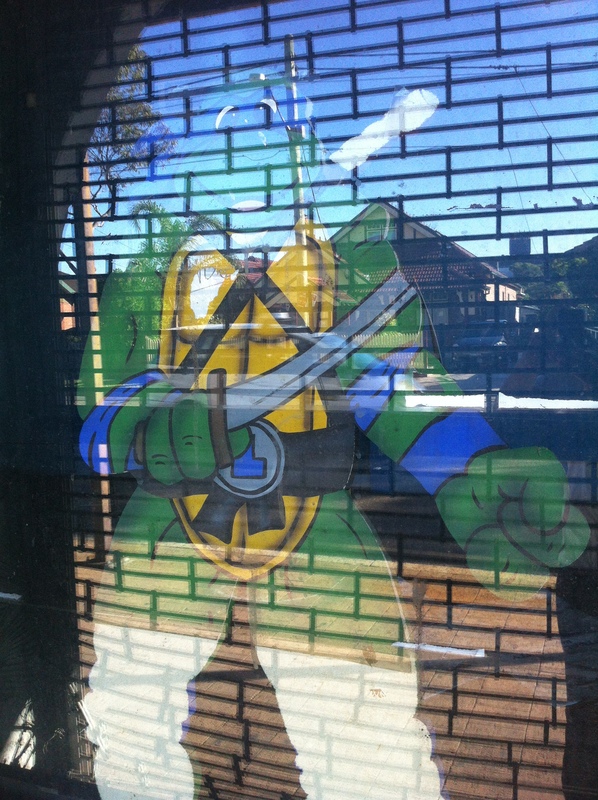 Leo stands as the building’s watchful protector – ready to cut down intruders with his blunt katana and a killer smile. Image courtesy Kelly & Sons Real Estate. Remember, if you like what you see, you too can lease this bad boy for only $130k pa. What a steal! Kelly & Sons – holla at me so I can let you know where to send my commission. What an ugly building. There, I said it. 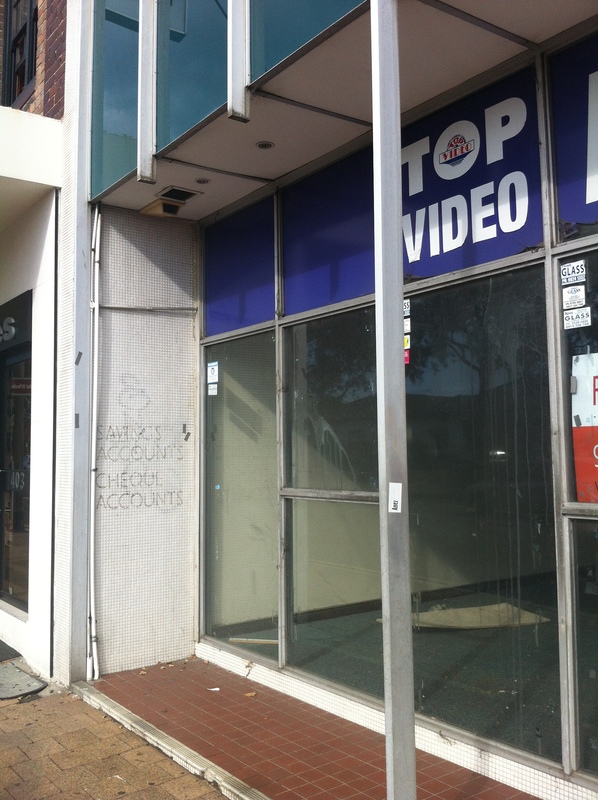 Despite Videomania acting as a testament to the failure of the video shop concept in Rosebery, Top Video at some point decided to make a go of it next door. Smart thinking. Setting up in what was clearly a bank (and before that, the Marina’s sweet shops), Top Video expected to bank fat coin on the back of Videomania’s failure. The new release poster left inside suggests that things went wrong around 2008-09. A legacy that started with Sparrows ends with You Don’t Mess With the Zohan. 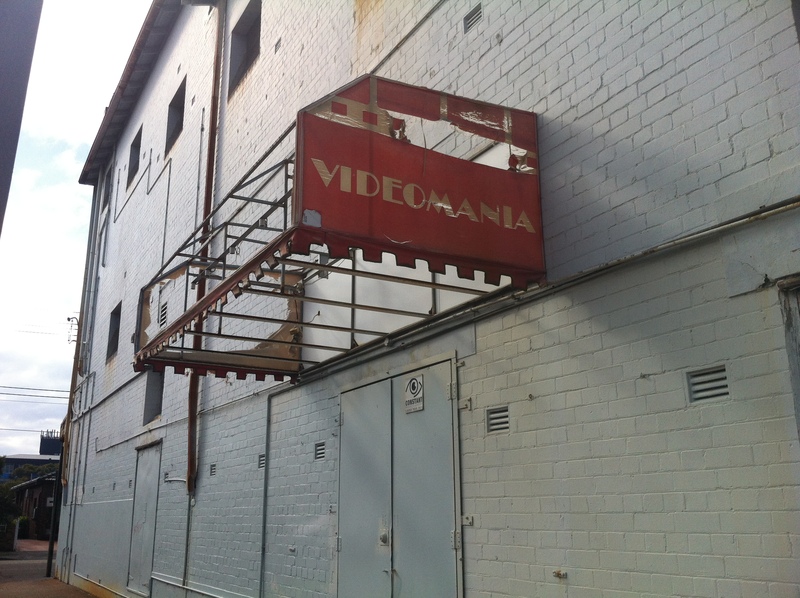 As I turned to leave, I took one last look back at Videomania, and it looked like the building was crying. Look at those top windows. 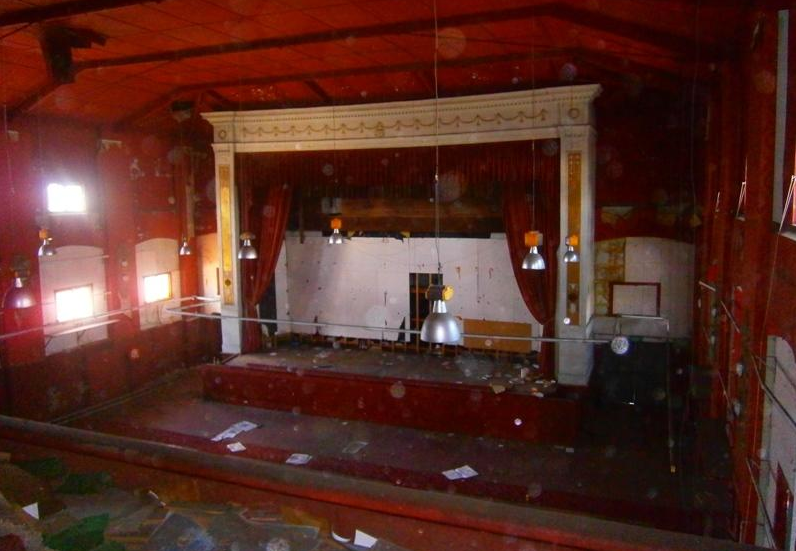 It was as if the theatre was imploring me, as the only one around who cared, to put it out of its misery. I would, Marina, honestly, it’s just…that Leonardo is one intimidating dude. From this, we can see the bank next door was in fact an ANZ, that the Videomania side entrance was once viable, and that VIRTUAL REALITY IS HERE. How else could I have known it was from 1996? FUTURISTIC UPDATE: I revisited the Marina a year later and made an explosive discovery. 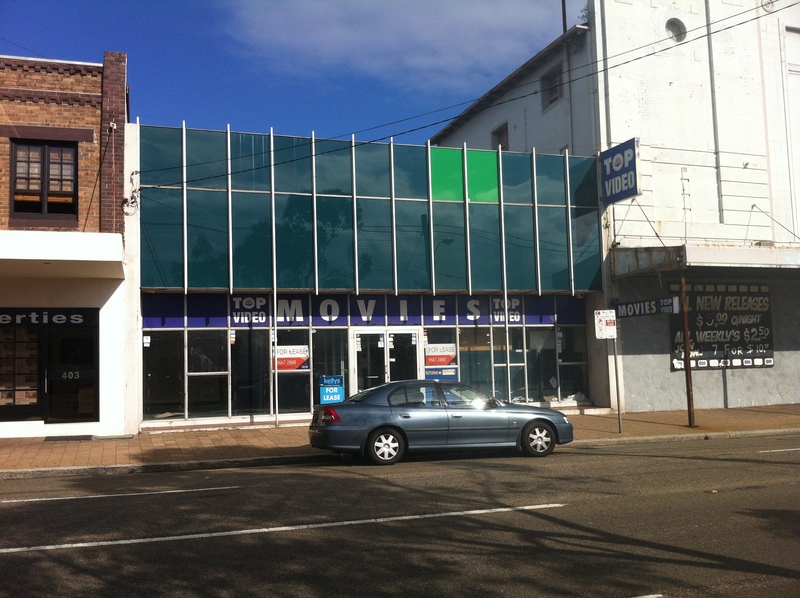 Another testament to the power and influence of video shops in the old days – it took three shops to replace one giant Video Ezy. 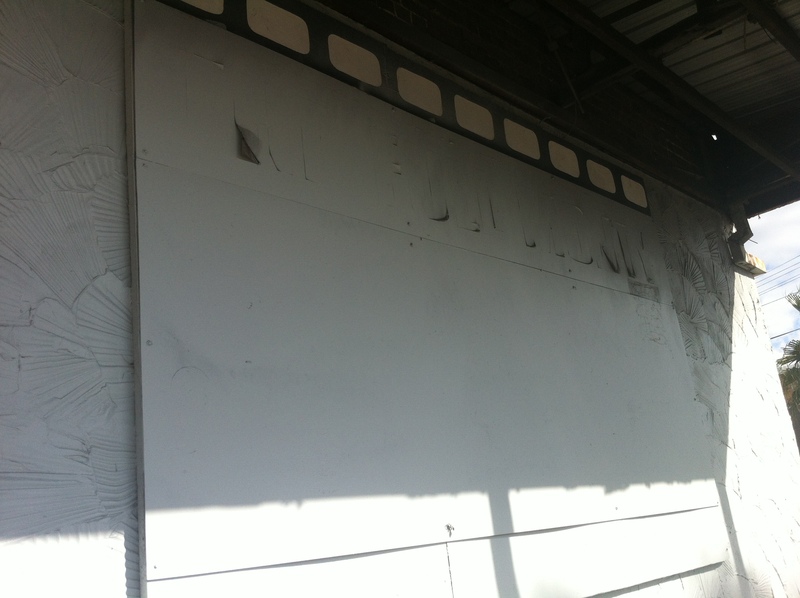 You can see on the left the space where new release posters would have hung, luring potential new members inside and forcing them to think of a password of the easily forgettable variety in order to get a video card just to be able to hire Maverick for the night. 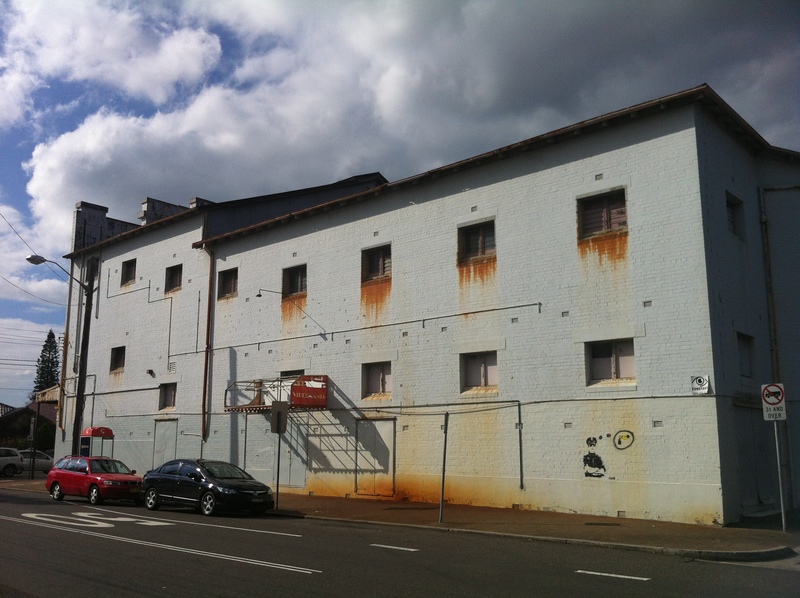 Sadly for the former king of weekly entertainment, Ezy Street is a long way away these days. Meanwhile, if you paired up locations of the ubiquitous Gloria Jean’s with Thai restaurants, you might find the number is a perfect match. Even Mickey D’s doesn’t cover this kind of territory. 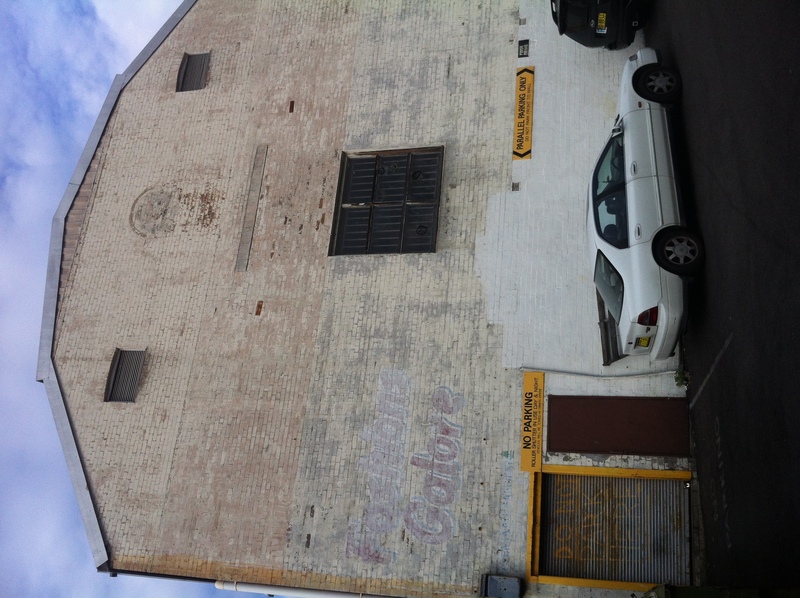 If it looks like a theatre etc… The discovery of the ‘Fashions Galore’ sign means that this is now probably the longest titled entry on this blog – quite an achievement given the competition. 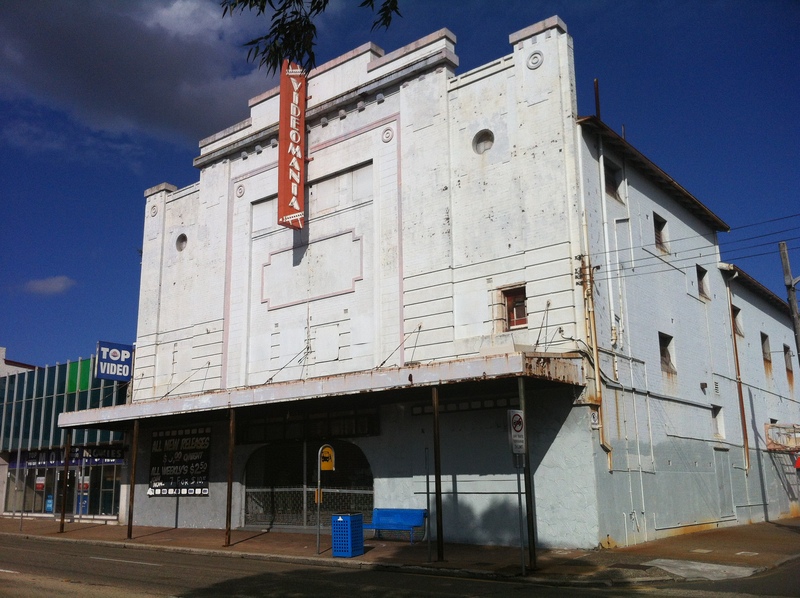 Epping Theatre is a bit of a mystery; apart from some old ‘staff wanted’ ads and its listing in several State Library photo archives (currently unseen), there’s not much out there. Or is there? Readers, if you can help, you know what to do. 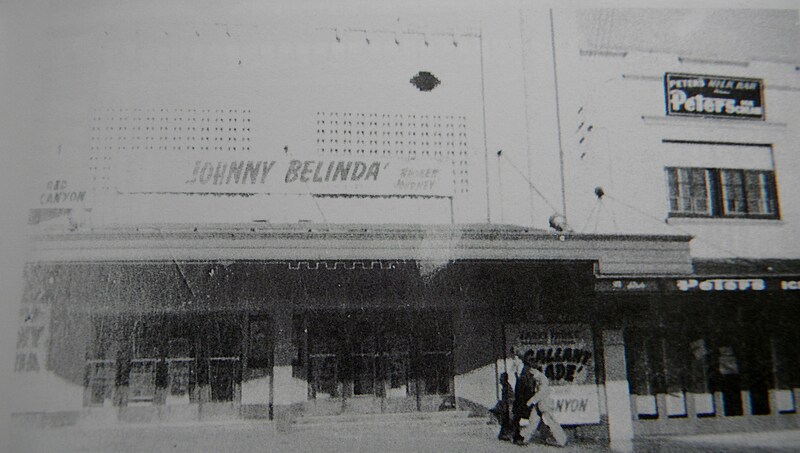 Epping Theatre, 1949. Thanks to reader Carmen for the image! 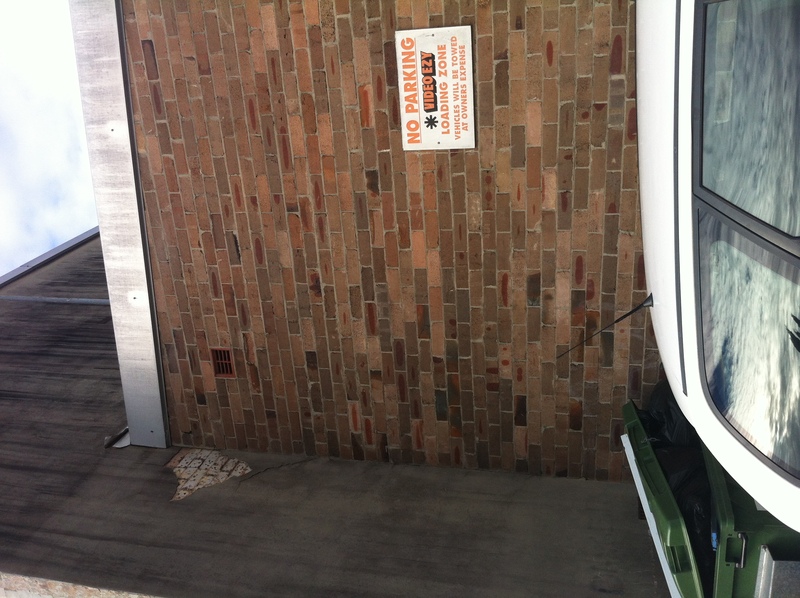 It says a lot about the current state of Video Ezy that this guy’s chosen to park there despite the sign. Ballsy. 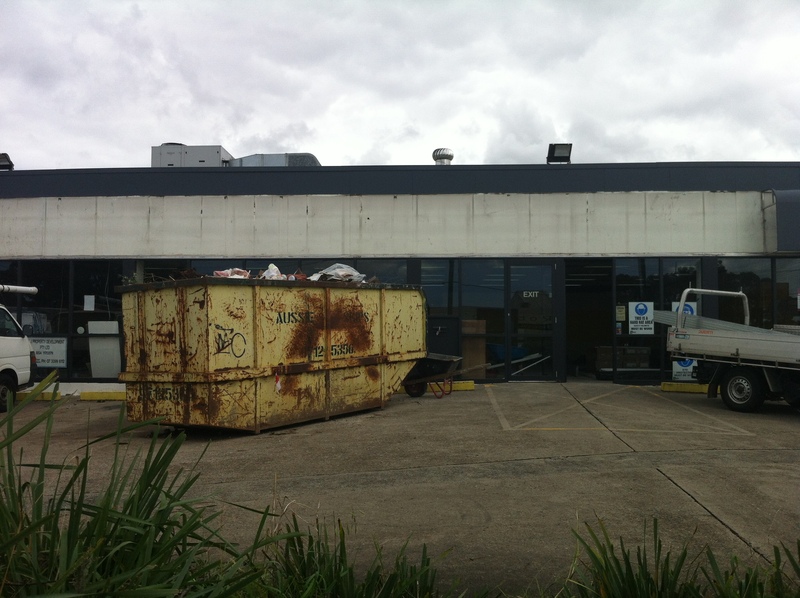 Despite the sign, Blockbuster’s presence at 1206 Canterbury Road, Roselands is pretty much gone. 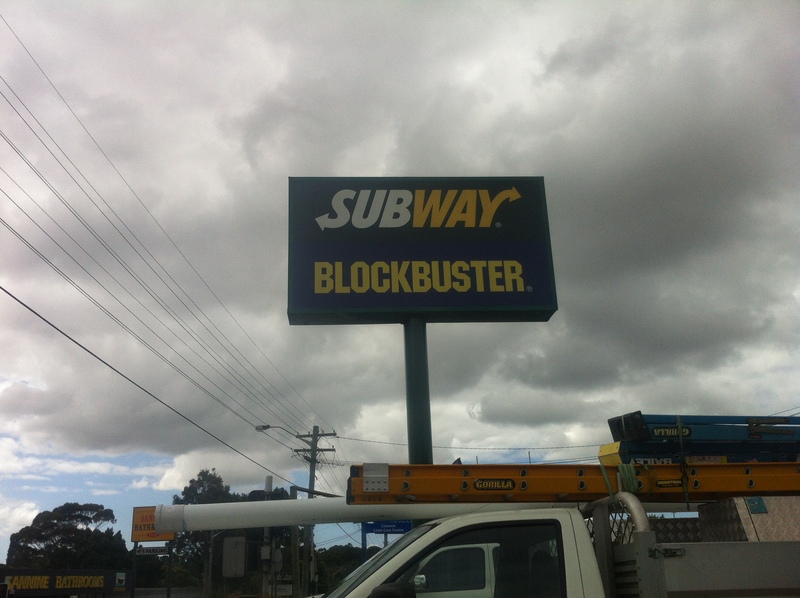 In 1996, Blockbuster was one of the biggest brands, and now they just can’t eradicate it fast enough. It’s as if Betamax was reincarnated as the head of Bovis Lend Lease. 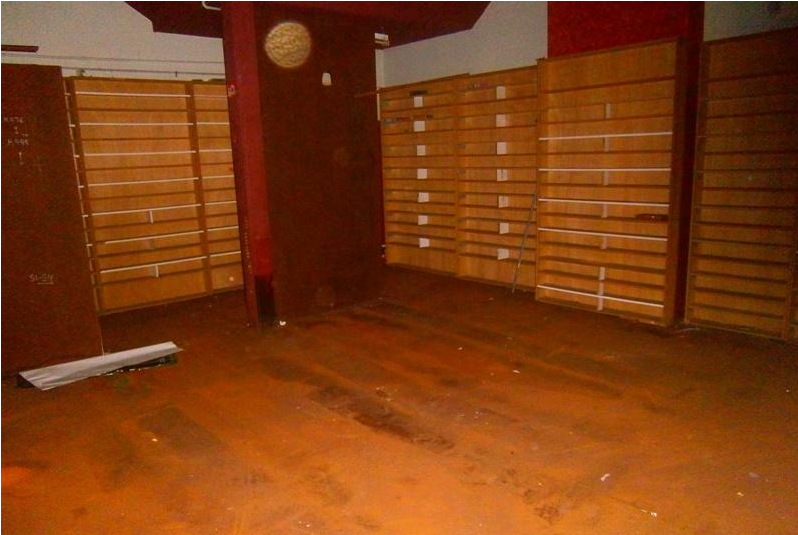 This one in particular is well on its way to becoming a 24-hour gym, just in case you need to pump some iron at 4am. Looks like you're busting the blocks just fine, guys. 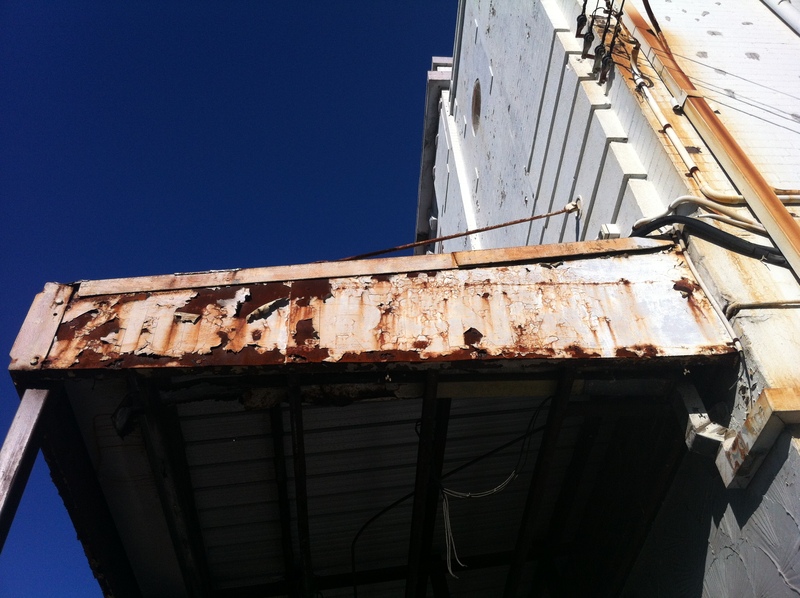 Research shows that as late as 1946, this address was being used to sell retired show horses. 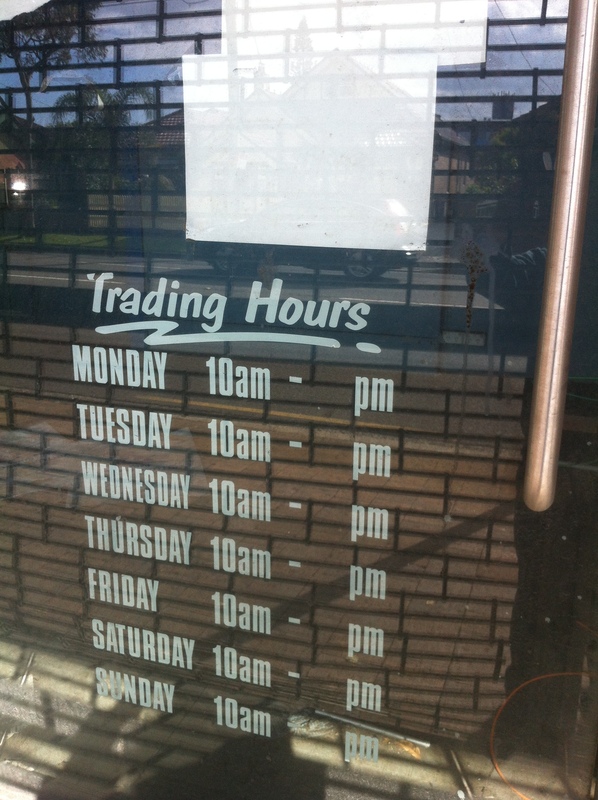 The Subway on the lot is still going strong, keeping the tradition of hawking old livestock here well and truly alive.